Notice! Saphir Resort & Spa Hotel does not accept reservations at this time. Please try again later. Saphir Resort & Spa Hotel Contact. Situated on the seafront of Okurcalar, Saphir Resort&Spa has a private sandy beach. We will be glad to comfort you as you are at home by providing you the finest service during your stay in holiday. The resort offers 2 outdoor pools, 3 water slides and spa facilities. The rooms of Saphir are decorated in soft colours to create a peaceful setting. They all include an LCD TV, air conditioning and a minibar. Some rooms offer sea views. The main restaurant serves meals in open buffet style, and it has indoor and outdoor dining areas. Vegetarian, diet and kids menus are available. The à la carte restaurants offer international dishes. There are also 6 bars on site. Spa facilities include a sauna, Turkish bath, and various massages for relaxation. You can also visit the gym for a workout, or play tennis. Alanya town centre is 32 km from the property. Antalya Airport is within 100 km. Saphir Resort & Spa Hotel accepts VISA and reserves the right to temporarily hold an amount prior to arrival. Saphir Resort & Spa Hotel accepts Master Card and reserves the right to temporarily hold an amount prior to arrival. Saphir Resort & Spa Hotel accepts Maestro and reserves the right to temporarily hold an amount prior to arrival. Saphir Resort & Spa Hotel accepts Bank card and reserves the right to temporarily hold an amount prior to arrival. Saphir Resort & Spa Hotel accepts ATM card and reserves the right to temporarily hold an amount prior to arrival. Free buffet meals in the morning, lunch and dinner. Some domestic alcoholic and non-alcoholic beverages are free of charge between 10.00-02.00 hours according to the brands that the facility has determined. Local drinks on disc are free. Ice cream service is available from 15.05 to 15.10. The a la carte restaurants serve between 15.05 - 30.09, 7 nights and over the entire stay, 1 restaurant is booked 1 time during the entire stay and it is free of charge. The day of the minibar is filled with soft drinks and other days are refreshed with water. It features a dietary diet and vegetarian menu. Single next to 0-12,99 years old is free of charge. 2 adults, 0-12,99 years and 2 children are free. 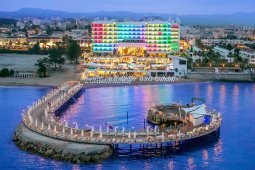 All Inclusive Plus accommodation on premises starts with dinner, includes dinner until the number of nights left, and ends on the morning of departure with breakfast. The best hotel I ever seen yet.